Print free pdf or play online. 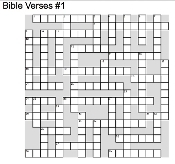 This printable crossword may be used to reinforce learning with Story 23 from "Open Bible Stories." Word list is included. It teaches about the Birth of Jesus.